We usually like to hatch our own chicks, but due to dogs, ducks, and other dilemmas, we only have five hens at the moment. And when I tried to hatch the eggs of three of those hens (Red Stars) last year, there seemed to be some sort of genetic problem that caused the chicks to die in the shell, so we really only have two hens with hatchable eggs at the moment. 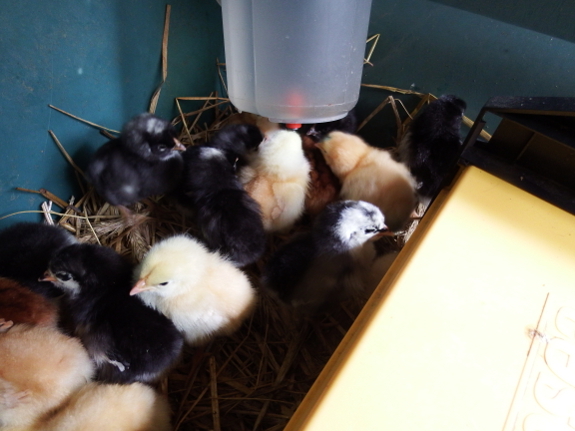 In the end, rather than saving eggs for two weeks to fill the incubator, we bit the bullet and ordered 25 unsexed chicks from Cackle Hatchery. Australorps are currently my favorite all-around chicken for our farm --- they're only okay layers, but they're meaty enough to make it worthwhile to eat the males as broilers and the birds are heavy enough that they don't usually fly fences and get into trouble in the garden. But I couldn't resist trying out four other breeds as well: Rhode Island Red, New Hampshire Red, Buff Orpington, and Dominique. I have a feeling the Rhode Islands and Orpingtons might end up being tractored hens due to flying fences (the former) and being too people-centric (the latter), but only time will tell. Hopefully next year we'll be back on track with a quality flock who will allow me to raise all of our meat chickens and eggs for the year. The white one on the far right with its head turned is the cutest think I've seen recently. (I know. I don't get out much! LOL!) S/he looks like s/he's saying Well, what's going on over there? 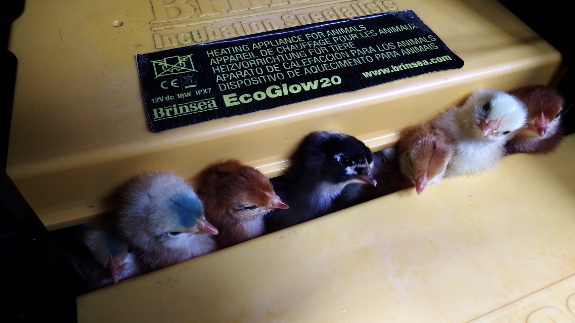 My brood is about 5 weeks old and just about ready to go into my "new" revamped chicken tractor (which weighs enough that only 3 people are needed to move it!). I think that Rhode Island Reds are just a little bit darker than New Hampshire. The NH Reds (my favorites) are a lighter reddish gold and the chicks don't tend to have any white on them, just creamy color with a reddish tint. Just from the photo, I would guess the red chick next to the yellow one is a NH, and those other two are RI Reds. New Hampshire reds are like a strawberry blond and the Road Island reds are a darker red. The Roadys are more aggresive hen. I appreciate the fact that you decided to get unsexed chicks. After I read Harvey Ussery's book on small-scale poultry farming, I'll never do otherwise too.